As it was discussed in Noise Cancellation Microphones, the addition of a second microphone provides the opportunity to significantly improve the signal to noise ratio (SNR) of a noisy speech signal. 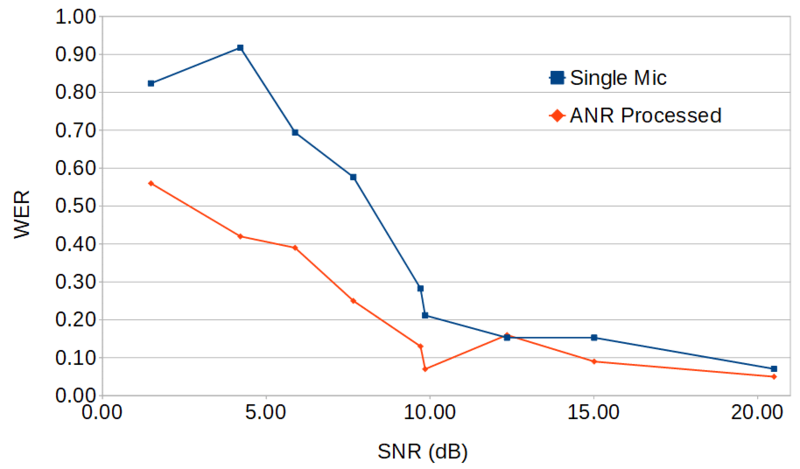 This SNR improvement not only subjectively improves the speech quality and intelligibility for human listeners, but the Word Error Rate (WER) for Automatic Speaker Recognition (ASR) engines. VOCAL Dual Channel Adaptive Noise Reduction (ANR) algorithm is well suited as a pre-processor for ASR engines because the noise reduction is achieved through a linear process, which introduces minimal distortions to the desired speech signal. This is important because it has been shown that single channel noise reduction techniques that apply non-linear suppression can increase the WER even though the SNR has improvement and the subjective quality has been enhanced. VOCAL’s ANR algorithm on the other has reduces the WER as evidenced by the chart below. This chart shows the ANR algorithm improves the WER by approximately 30% for low SNR scenarios. For high SNRs the accuracy of the ASR was already high, but the ANR is able to gain a few percentage points over the unprocessed microphone. VOCAL’s Noise Cancellation software is available as a standalone module for use as a pre-processor for ASR engines or a speech enhancement algorithm for full-duplex audio communications. Please contact us to learn more.